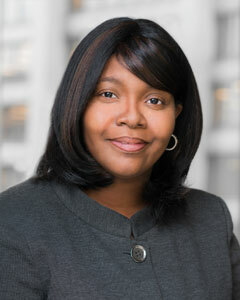 Sherita S. Glover is an Associate Attorney at Brennan Burtker LLC. Ms. Glover was hired as the firm’s first Associate when the firm was founded in July, 2015. She concentrates her practice in civil litigation with an emphasis on Medical Malpractice Defense and Appellate Law. Ms. Glover completed law school while working full time as a legal administrative assistant, wife and mother. Since her admission to the bar in May of 2015, Ms. Glover has successfully represented hospitals, medical groups and physicians in numerous cases, many of which have resulted in dismissals for her clients. Ms. Glover also has extensive experience in HIPAA Compliance. Ms. Glover is a graduate of Roosevelt University where she majored in Business Communications. She received her Law Degree from The John Marshall Law School where she received the highest grade in her class in Civil Litigation and Constitutional Law II. The John Marshall Law School of Chicago, J.D.